There can be quite a bit of frustration today as Mars and Saturn move towards a challenging square aspect. There can be criticism, whether we face this within ourselves or through others, and perhaps even imagined disapproval. We can also find it difficult to be direct with one another today. The Moon is in Scorpio all day (until Friday, January 16th, at 3:01 AM). 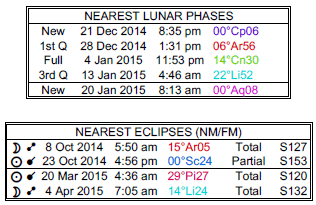 The Moon is in its Last Quarter phase. This is a day to keep your eye on the prize, not on the process, dear Aries. There may be obstacles or slowdowns to deal with, and a sense that you can’t express yourself, your desires, or your frustrations in direct, effective ways. You could be feeling that you’re stuck in the past, unable to move forward. 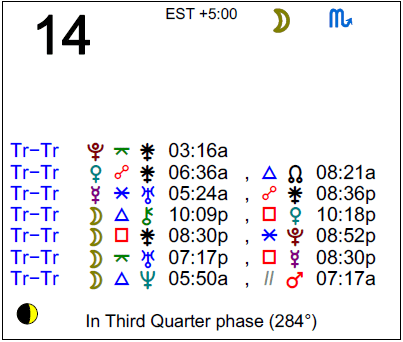 With Mars now in your solar twelfth house, some attention to, or preoccupation with, the past is in fact quite appropriate; but this is about putting challenging situations behind you, not obsessing over those things you can’t control. For some of you, there could be concern about something that you’ve said coming back to haunt you. The best way to deal with tensions now is to remind yourself that you can’t always push ahead quickly. Do your best and trust that it will be worth your time to do so. While the day can start off with a sense of moving forward, dear Taurus, as it progresses, you could be dealing with a reality check, challenge, or block. Try your best to respond to challenges with patience and mindfulness. Success depends on your ability to focus on doing your best in the moment. Difficulties or aggravations with a friend or group effort could be part of the picture now. There could be hard feelings and resentments stirred up. In truth, encountering blockages can be viewed as a message to slow yourself down. Keep in mind that simmering, bottled up anger will do little for your health and well-being, and on the other end of it, exploding with anger can be destructive as well. Stay emotionally detached for best results, especially if faced with criticism. While the morning is strong for personal appeal and socializing, there can be aggravations with a partner or a superior later today, dear Gemini, and perhaps a sense that you’re blocked from pursuing your goals. Challenges may have to do with something you’ve buried or tucked away before resolving. Watch for defensiveness, which won’t help your case. Plans may be overturned due to a delay, rule, or obligation that needs your attention. Try not to waste time on anger, look for the lesson, and then focus on doing your best with what you have in front of you. Haste makes waste today. This morning is strong for solving problems with a fresh, forward-looking perspective, dear Cancer, but as the day progresses, you may need to slow down and tend to details you’ve previously missed. You may be dealing with stubbornness in others or blocked plans, and it’s best to detach yourself emotionally just enough to let go of frustration. The harder you push or the stronger you come on, the more resistance you’re likely to encounter. You might also find that you are digging in your heels about a belief or moral issue, and this can frustrate or aggravate an associate. Try not to waste time and energy on things that can’t be changed right now. Concentrate on improving relationships, as this area of life can see movement and growth today. This may not be the smoothest day for interpersonal relations, dear Leo. A flippant mood can actually irritate others today, so pause to feel out your “audience” before making light of a situation. Misunderstandings with a love interest can pose a problem today, especially when it comes to intimate matters or issues of finance and power dynamics. Patience is required today, as people around you can be more easily frustrated or stressed out. Draw upon your strong perceptive ability and sense of rhythm to see when it’s better to move ahead and push forward, and when it’s best to slow down or yield. Today, you may find it’s best to concentrate on those things that are working for you and to wait for a better day to take on a challenge. The first half of the day is strong for communicating effectively and for a certain confidence when it comes to reaching out to others, but also for thinking in unique, unusual ways. However, as the day progresses, dear Virgo, there can be stop and go energy in your relationships. Interactions may suffer from poor timing or the perception that others are critical and disinterested. There can be a feeling of being blocked, either by others or by circumstances, and this can be frustrating. However, it’s also a message from the cosmos to be patient, to wait things out, and to spend a little more time getting things right before pushing ahead with your plans. Good energy is with you this morning for outside of the box thinking, dear Libra. As the day advances, it can be difficult to work quickly and straightforwardly towards a goal. There may be blocks in communication, such as mechanical breakdowns or misunderstandings, that get in the way. Work can be frustrating, and patience is important, although difficult to muster up. Delays may give you the chance to make important refinements and edits, however, so try to see them in a favorable light so that you don’t waste even more energy on stress. There is an opportunity to strengthen a relationship today, however, if you concentrate on being reliable and steady. Inertia may be a problem today, dear Scorpio, even though you could be itching to get things done. There could be problems funding your plans or unexpected expenses could be an issue. For some, worries and concerns put a damper on the day and prevent you from realizing your goals. Take your time, avoid pushing in the face of resistance, but do pay attention to your responsibilities and fulfill them to the best of your ability. Avoid focusing on what you can’t have, and this can be a productive day. There is also nice energy for making important connections. You may be feeling off-center and a tad unyielding today, dear Sagittarius, particularly if you feel that others are trying to rush or push you. Take a deep breath and do what you can to keep a positive frame of mind. With patience and determination, you can be very productive today, particularly if your goal is to work through details. You tend to prefer to stay in the background today, and you could find that you’re more sensitive than usual to the emotional atmosphere around you, further encouraging you to withdraw. Love matters may not be progressing as you’d like just for now. There can be communication or transportation delays to deal with today, dear Capricorn, but while they appear to set you back, they could point you in the direction of important issues that you would have missed if you hadn’t slowed down. Finish up those things that need a little more attention rather than pushing ahead right now. Your ability to take criticism may be tested today for some of you, and for others, you could be wrestling with your inner critic, as you could be feeling that what you’re doing now is not your best. Detach yourself, get exercise, and take breaks in order to better manage potential frustrations. While morning is good for communications, tension and blockages are likely to revolve around your social life and finances as the day progresses, dear Aquarius, and these areas of life don’t mix well today. You may want something you can’t have, plans could fall through with a friend, or there could be an obligation to fulfill that prevents you from pursuing your goals. Try not to let any of this get to you. Resolve to save more, or to carry out your plans on a better day. If you’re applying your energy to a difficult task and it only serves to frustrate you, try putting it aside. Creativity will return soon. You can be feeling a strong desire to press forward, but obstacles seem to be around you, dear Pisces, unless you consciously choose to slow down. People may not be supporting your plans just for now, particularly authority figures. Awkward energy is with you that has the effect of slowing you down when you’d prefer to move quickly. A rule or a superior might be blocking you from going where you want to go. Try not to react with impatience – there is a time for action, and there is a time for review, and the latter applies to you today. 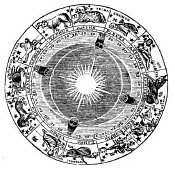 If Your Birthday is January 14th, If Today is Your Birthday full horoscope here. This may be a self-centered, self-indulgent time. We might also resort to trickery or manipulation to get what we want, when a more direct route would be more appropriate. Power games can interfere with healthy relations. There can be a conflict of values, or the differences between ourselves and those close to us are exaggerated in our minds right now. Even so, through conflict, we can get to a better state of understanding. There may be subtle changes in relationships that are confusing now, or the need to make changes and adjustments becomes clear, as tensions, negative feelings, and resentment might be undermining our relationships. We may not be sure of where a relationship or partnership is heading. Moon 05° Capricorn 46' 39"